A picture of some low-calorie fruit and vegetable snacks, including apples, asparagus, beetroots, bell peppers, endives, and tomatoes. 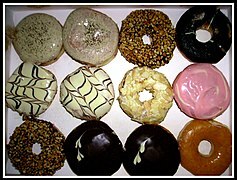 A snack is a small service of food and generally eaten between meals. 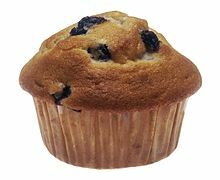 Snacks come in a variety of forms including packaged snack foods and other processed foods, as well as items made from fresh ingredients at home. Traditionally, snacks are prepared from ingredients commonly available at home without a great deal of preparation. Often biscuits, chocolate, cold cuts, fruits, leftovers, nuts, popcorn, sandwiches, and sweets are used as snacks. The Dagwood sandwich was originally the humorous result of a cartoon character's desire for large snacks. With the spread of convenience stores, packaged snack foods became a significant business. 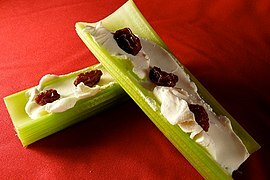 Snack foods are typically designed to be portable, quick, and satisfying. 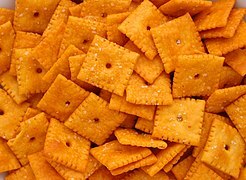 Processed snack foods, as one form of convenience food, are designed to be less perishable, more durable, and more portable than prepared foods. They often contain substantial amounts of sweeteners, preservatives, and appealing ingredients such as chocolate, peanuts, and specially-designed flavors (such as flavored potato chips). Beverages, such as coffee and tea, are not generally considered snacks although they may be consumed along with or in lieu of snack foods. 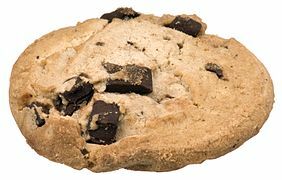 A snack eaten shortly before going to bed or during the night may be called a "bedtime snack", "late night snack", or "(mid)night snack". 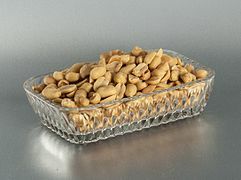 In the United States, a popular snack food is the peanut. Peanuts first arrived from South America via slave ships and became incorporated into African-inspired cooking on southern plantations. After the Civil War, the taste for peanuts spread north, where they were incorporated into the culture of baseball games and vaudeville theaters. 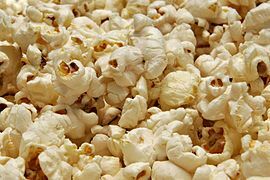 Along with popcorn (also of South American origin), snacks bore the stigma of being sold by unhygienic street vendors. The middle-class etiquette of the Victorian era (1837–1901) categorized any food that did not require proper usage of utensils as lower-class. Pretzels were introduced to North America by the Dutch, via New Amsterdam in the 17th century. In the 1860s, the snack was still associated with immigrants, unhygienic street vendors, and saloons. Due to loss of business during the Prohibition era (1920-1933), pretzels underwent rebranding to make them more appealing to the public. As packaging revolutionized snack foods, allowing sellers to reduce contamination risk, while making it easy to advertise brands with a logo, pretzels boomed in popularity, bringing many other types of snack foods with it. By the 1950s, snacking had become an all-American pastime, becoming an internationally recognized emblem of middle American life. Indonesian snacks, such as tahu isi, pisang goreng, risoles, timpan, lemper, and kue pisang. Indonesia has a rich collection of snacks called kue (cakes and pastry), both savoury and sweet. Traditional kue usually made from rice flour, coconut milk, coconut sugar and mostly steamed or fried instead of baked. Traditional kue are popularly known as kue basah ("wet kue") that has moisty and soft texture because of rich coconut milk. The kue kering (dried kue) is local name for cookies. Indonesia has rich variations of kue, both native-origin or foreign-influenced. Popular ones include Bika Ambon, kue pisang, kue cubit, klepon, onde-onde, nagasari, kue pandan, lupis, lemang, lemper, lontong, tahu isi, getuk, risoles, pastel, lumpia, bakpia, lapis legit, soes, poffertjes and bolu kukus. Krupuks in air-tight tin cans. Traditional crackers are called krupuk, made from bits of shrimp, fish, vegetables or nuts, which are usually consumed as a crunchy snack or to accompany main meals. These crispy snacks sometimes are added upon the main meal to provide crunchy texture; several Indonesian dishes such as gado-gado, karedok, ketoprak, lontong sayur, nasi uduk, asinan and bubur ayam are known to require specific type of krupuk as toppings. There are wide variations of krupuk available across Indonesia. The most popular ones would be krupuk udang (prawn crackers) and krupuk kampung or krupuk putih (cassava crackers). Other popular types include krupuk kulit (dried buffalo-skin crackers), emping melinjo (gnetum gnemon crackers), and kripik (chips or crisps), such as kripik pisang (banana chips) and keripik singkong (Cassava chips), rempeyek, is a flour-based cracker with brittle of peanuts, anchovies or shrimp bound by crispy flour cracker, rengginang or intip (Javanese) is rice cracker made from sun-dried and deep fried leftover rice. Cincin - a deep fried dough pastry-based snack popular with East Malaysia's Muslim communities. Roti john - a spiced meat omelette sandwich, popularly eaten for breakfast or as a snack. Bakkwa (Chinese : 肉干) - literally "dried meat", bakkwa is better understood as barbecued meat jerky. While this delicacy is especially popular during the Chinese New Year celebration period, it is available everywhere and eaten year round as a popular snack. Idli - made from a mashed mixture of skinned black lentils and rice formed into patties using a mould and steamed, idlis are eaten at breakfast or as a snack. Idlis are usually served in pairs with vadai, small donut-shaped fritters made from mashed lentils and spices, chutney, and a thick stew of lentils and vegetables called sambar. 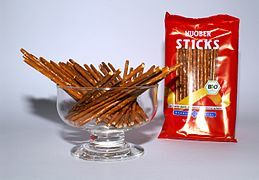 Murukku - a savoury snack of spiced crunchy twists made from rice and urad dal flour, traditionally eaten for Deepavali. Vadai, vada or vades - is a common term for many different types of savoury fritter-type snacks originated from South India with a set of common ingredients. The most common ingredients are lentils, chillis, onions and curry leaves. Pisang goreng - a common snack sold by street vendors, battered fried bananas are also served in a more elaborate manner at some cafes and restaurants as a dessert. Cempedak and various tuber vegetables are also battered and fried in the same manner as variations. Miang kham – dried shrimp and other ingredients wrapped in cha plu leaves; often eaten as a snack or a starter. Sai ua – a grilled sausage of ground pork mixed with spices and herbs; it is often served with chopped fresh ginger and chilies at a meal. It is sold at markets in Chiang Mai as a snack. 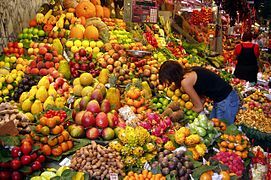 Government bodies, such as Health Canada, recommend that people make a conscious effort to eat more healthy, natural snacks - such as fruit, vegetables, nuts, and cereal grains – while avoiding high-calorie, low-nutrient junk food. A 2010 study showed that children in the United States snacked on average six times per day, approximately twice as often as American children in the 1970s. This represents consumption of roughly 570 calories more per day than U.S. children consumed in the 1970s. 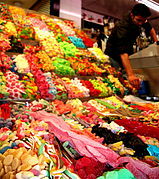 A Tufts University Department of Psychology empirical study titled "Effect of an afternoon confectionery snack on cognitive processes critical to learning" found that a consumption of a confectionery snack in the afternoon improved spatial memory in the study's sample group, but in the area of attention performance it had a mixed effect. ^ "Snack". Dictionary.com. Retrieved 2011-03-13. ^ Lat, Jeff. "Sweet Snacks". Blogspot.com. Retrieved 19 June 2016. ^ a b c Carroll, Abigail (2013-08-30). "How Snacking Became Respectable". Wall Street Journal. ISSN 0099-9660. Retrieved 2016-05-29. ^ "America: just one long snack bar". Ellensburg Daily Record. April 3, 1973. Retrieved December 14, 2018 – via Google News. ^ Heinz Von Holzen; Lother Arsana (2015). Food of Indonesia: Delicious Recipes from Bali, Java and the Spice Islands. Tuttle Publishing. ISBN 9781462914913. ^ a b "Say Yes to Healthy Snacks!". Illinois Early Learning Project. Archived from the original on January 26, 2012. Retrieved December 14, 2018. ^ "Smart Snacking - Canada's Food Guide". Health Canada. Retrieved 2011-03-13. ^ "New Trend Shows Kids Snacking Every Few Hours". NPR.org. Retrieved 2010-03-11. ^ "American Diet Then and Now: How Snacking Is Expanding the Country's Waistline - ABC News". ABC News. Retrieved 20 February 2016. ^ Mahoney, Caroline R.; Taylor, Holly A.; Kanarek, Robin B. (2007). "Effect of an afternoon confectionery snack on cognitive processes critical to learning". Physiology & Behavior. 90 (2–3): 344. doi:10.1016/j.physbeh.2006.09.033. Wikimedia Commons has media related to Snack food. "Wikibooks Cookbook – A collection of recipes from around the world". Wikibooks.